Photo by Lisa S. Cleveland. LEXINGTON, Ky. (March 20, 2019) — University of Kentucky Transportation Services' Pink Route (Kentucky Clinic Shuttle), which currently provides direct shuttle service between the Press Avenue Garage (PS #6) and the Kentucky Clinic, will permanently end on Friday, March 29. The Pink Route was originally instituted as a temporary route during construction of UK’s Biomedical Biological Sciences Research Building (BBSRB). At that time, it provided a convenient mobility option for employees during the construction project, which blocked central pedestrian access. During the 2015 Transportation Master Plan (TMP) process, Transportation Services redesigned the campus transit experience to provide improved access, frequency and efficiency. A key component of this effort was to ensure that every place on campus was within a five-minute walk of a campus bus stop. Since the Press Avenue Garage is less than a five-minute walk from the Kentucky Clinic, operating a shuttle between these facilities is both inefficient and in conflict with the principles set forth in the TMP. However, Transportation Services was reluctant to eliminate the Pink Route until construction on the Healthy Kentucky Research Building was completed and localized pedestrian safety issues were addressed. 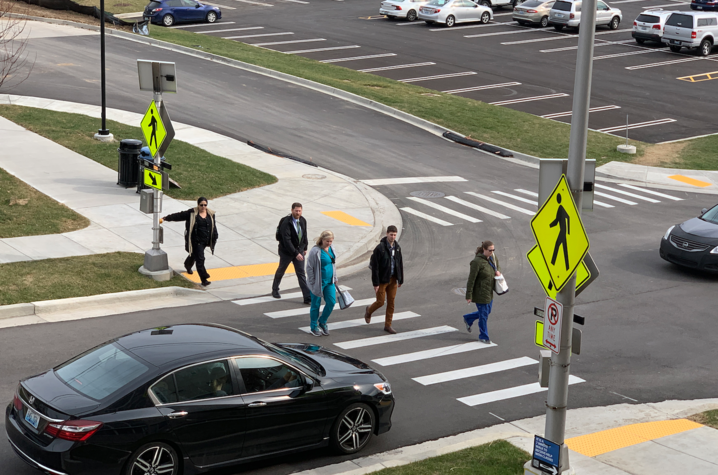 Since that time, Transportation Services has worked closely with the university’s Capital Projects Management Division and the Healthy Kentucky Research Building design team to dramatically improve pedestrian access from the Press Avenue Garage to the new facility, as well as to the Kentucky Clinic and beyond. In addition to providing improved and intuitive access via the Healthy Kentucky Research Building to the elevated pedestrian walkway spanning South Limestone into the Kentucky Clinic, the project also simplified traffic flow on Press Avenue by aligning the entry drives to the Press Avenue Garage and the Press Avenue North Lot and loading dock and constructed an enhanced mid-block pedestrian crossing at the Press Avenue Garage southern stair tower. These improvements are now complete and heavily used. Once Pink Route service ends, employees with mobility challenges who typically park in the Press Avenue Garage should consider using the existing bi-directional campus loop (Blue and White Route), which has a bus stop adjacent to the Kentucky Clinic at Sanders Brown and a corresponding stop across South Limestone at the Lee T. Todd, Jr. Building. These bus routes allow employees to park in a variety of lots along the route (the Kroger Field Blue and Red lots on south campus, the South Limestone Garage (PS #5) and the Scott Street parking lots on north campus) with convenient access to and from the Kentucky Clinic area. Employees also have the option to park in the Orange Lot, which has direct shuttle service to the Health Science Research Building (HSRB) and Chandler Hospital Pavilion A via the Orange Route. Employees who have ADA accessible permits can also park in the expanded ADA accessible lot located at the corner of Huguelet Drive and Rose Street. This lot is adjacent to the Kentucky Clinic and has 64 ADA accessible spaces, 25 added during summer 2018. Additionally, the Press Avenue North Lot, located immediately adjacent to the Healthy Kentucky Research Building, reopened this past fall with eight new ADA accessible parking spaces available to permit holders on a first come, first served basis. Transportation Services, in partnership with the Disability Resource Center and the Office of Institutional Equity and Equal Opportunity, has expanded campus student paratransit service this year to accommodate special needs of employees. For more information about paratransit services, employees should contact the Office of Institutional Equity and Equal Opportunity. Impacted employees with special circumstances can also contact Transportation Services for assistance with personalized commute planning. For more information, visit www.uky.edu/transportation and follow UK Transportation Services on Twitter @UKParking.